Eyes are a major recurring motif in Apocrypha. To be fair, eyes were a frequently recurring motif throughout The X-Files. Rob Bowman managed a couple of beautiful shots of reflections and peeping in 731, for example. It makes sense that The X-Files should place such emphasis on eyes – it is a saga about truth and belief and faith, all of which must be explored through perception. “I want to believe,” Mulder’s iconic poster proclaims. As the cliché goes, seeing is believing. That is definitely the case here, with Apocrypha built to a climax where both the audience and the characters are explicitly refused the opportunity to see key moments. 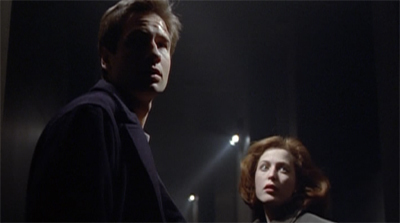 Mulder and Scully are escorted out of the North Dakota silo before they can see anything incriminating. The audience doesn’t even get to see the space ship taking off. 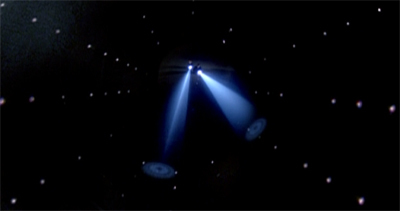 Even the death of Luis Cardinal takes place off-screen, with Mulder revealing it in a throwaway line in the show’s penultimate scene. With all of this going on, it makes sense that so much of the imagery in Apocrypha should be built around eyes – with the black oil infection manifesting in its hosts’ eyes, the shooting of the silo as a giant eye staring into space, and even the design of the alien space ship evoking the Eye of Providence. Piper Maru and Apocrypha continue a pretty clear thematic throughline for the show’s third season mythology episodes. As with The Blessing Way/Paper Clip and Nisei/731, Piper Maru and Apocrypha tell a story about how we relate to the past. In particular, in keeping with the rest of the third season mythology, it is a show about the legacy of the Second World War. The X-Files is a show that is sceptical of the decisions made by the American government towards the end of the Second World War, particularly as those decisions shaped and moulded the present. In many ways, The X-Files is a show about history and legacy, trauma and consequence. Piper Maru and Apocrypha are less direct about this connection than the earlier mythology episodes. They aren’t about the war criminals given safe habour after the Second World War in return for scientific knowledge or tactical advantages. Instead, Piper Maru and Apocrypha are shows about dredging up the past and confronting the consequences of past actions. These two episodes are not only steeped in American popular history, but also in the show’s internal continuity. The majority of what happens here is driven by events we’ve seen in the show. At the same time, Piper Maru and Apocrypha represent an attempt to boldly expand and push the mythos forward in the same way that Colony and End Game did at this point in the second season. The result is an intriguing two-parter that feels a little muddled and messy, an example of the show stumbling slightly as it tries to grow outwards. Although the mythology is still working a lot more efficiently than it would in later seasons, there is a sense of clutter beginning to filter in.